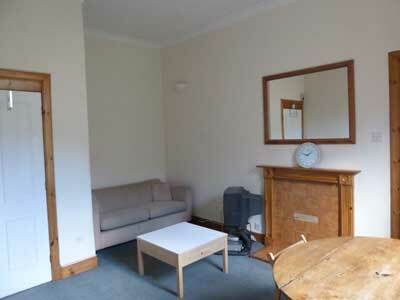 This smart, 2 bedroom flat would suit either professional persons or students. 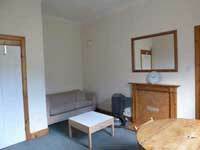 Central location with views of Castle and Exchange Square financial district (2 minutes walk to Edinburgh College of Art / Grassmarket / Lothian Road, 5 minutes to Princes Street / West End, 15 minutes to Edinburgh University / Waverley Station). Very convenient for shops, theatres, cinemas and main bus routes (1, 2, 10, 11, 15, 15A, 16, 17, 23, 24, 27, 34, 35, 45) in the local area (Lothian Road, Grindlay Street, Castle Terrace, West Port, Grassmarket). 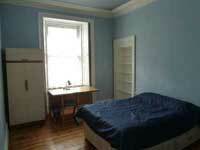 There are 4 main rooms: 2 double bedrooms, a living/dining room and separate kitchen. 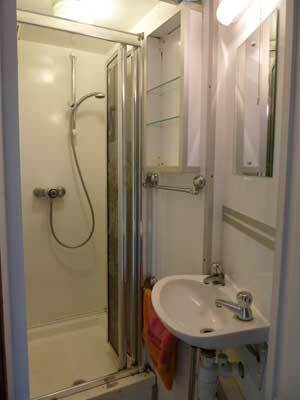 Shower room and separate WC plus cupboard storage space. 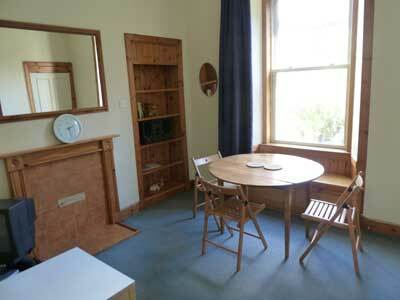 Fully furnished and equipped to a good standard. Kitchen with all mod cons; gas hob, built-in oven, microwave, fridge/freezer, washing machine, combi-boiler, etc. Gas central heating, instant hot water and double glazed throughout. Fully integrated smoke / heat / carbon monoxide alarm system. Zoned parking available on street. Multi-storey car park just round the corner. Click on a room (or the links on the left) for more information and photographs of each room. Livingroom: Bright, rear facing living room / dining room with sofa, dining table and chairs. Storage cupboard, feature fireplace (closed), wall lights, central heating radiator. Bedroom 1: Generously proportioned double bedroom with double glazed window giving views to the castle, Grindlay Street and Exchange Square. 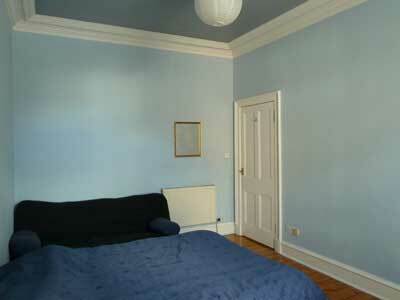 Varnished pine floor, working shutters, central heating radiator, ceiling cornice and centre rose. Double bed, wardrobe, chest of drawers, desk. Bedroom 2: Front facing second bedroom with double glazed window giving a view to the castle. 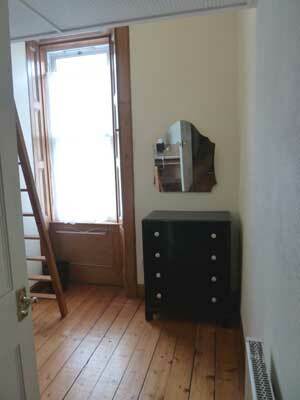 Some original features: Varnished pine floor, working shutters, central heating radiator and platform double bed with pine ladder. 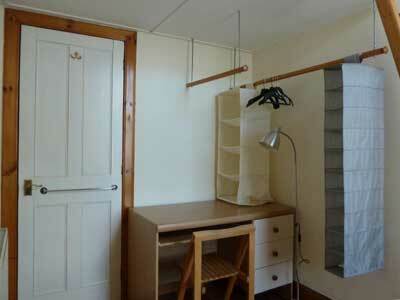 Clothes hanging space, chest of drawers, desk. Kitchen area: Modern fitted kitchen with all mod cons: Gas hob, integrated hood, built-in electric oven, 1.5 bowl sink, fridge/freezer, microwave oven, toaster, kettle, etc. Washing machine. 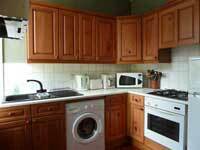 Vinyl flooring, ample high and low level storage cupboards, gas boiler, central heating radiator. Window to rear. Shower room: The shower room is attractively fitted with a neat shower enclosure with sheeted walls. 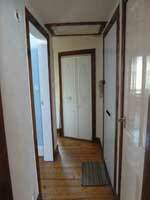 Tiled floor, instant shower - fed via the gas combi-boiler. White wash hand basin, decorated glass panelled door. Hall: Neat hall with natural finishes: Varnished pine floor, panelled doors and storage attic, central heating radiator. 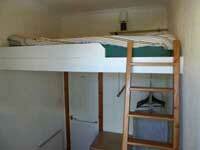 Access to WC, main rooms and shelved storage cupboard. Security intercom system.